SpaceX had previously flown first-stage rockets back to land after Florida launches but had not done so on the West Coast. Joe Johnston/The Tribune (of San Luis Obispo) via AP Foto:Two streaks in this long exposure photo show a SpaceX Falcon 9 rocket lifting off, left, from Vandenberg Air Force Base, as seen from Pismo Beach, California, October7, 2018, and then its first stage returning, right, to Earth at a nearby landing pad. A SpaceX Falcon 9 rocket carried an Argentine Earth-observation satellite into space Sunday and for the first time landed a first-stage booster back at its California launch site. 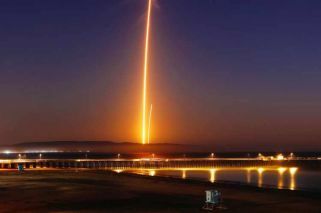 The primary purpose of the mission was to place the SAOCOM 1A satellite into orbit, but SpaceX also wanted to expand its recovery of first stages to its launch site at Vandenberg Air Force Base, about 130 miles (209 kilometers) northwest of Los Angeles. The Air Force last week advised residents on the central California coast they might see multiple engine burns by the first stage and hear one or more sonic booms as it returned. SpaceX also has successfully landed Falcon 9 first stages on so-called drone ships off the coasts of Florida and California, all as part of its effort to decrease the cost of space launches by reusing rockets rather than allowing them to fall into the ocean. The satellite is the first of two for Argentina's space agency, Comision Nacional de Actividades Espaciales, and will work in conjunction with a constellation of Italian space agency satellites. Its name is short for Satelite Argentino de Observacion Con Microondas. SAOCOM 1A carries a high-resolution instrument called a synthetic aperture radar that will be used for emergency management during disasters and for land monitoring. The second satellite will be SAOCOM 1B.